Displays documents, X-rays, DNA autorads, photos, transparencies, and 3-D objects. It can also display positive or negative modes. Includes one auxiliary A/V input that supports external input devices such as a DVD player or an audio deck. Special features included are auto-focus and high powered zoom. Provides on-screen, multicolor annotation capabilities to highlight images from any input source including the document camera, or computer. A variety of pointer arrows, colors, and lines are available that can direct attention to critical details on the screen. 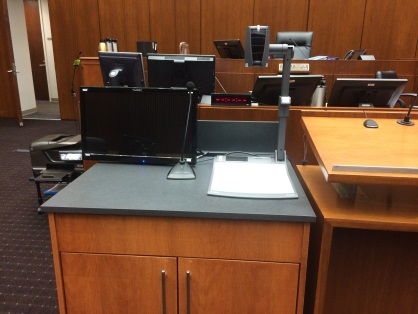 Supports two tablets: one for counsel at the lectern and one for the witness at the witness stand. Available to the judge and counsel via a wired connection. However, proprietary software is required on individual computers in order to receive real-time transcription. Counsel should contact the official Court Reporter for the software version and any special system requirements needed for installation. Switches between input and output selections. The judge retains control of all video and audio displays prior to publication to the jury via an icon. 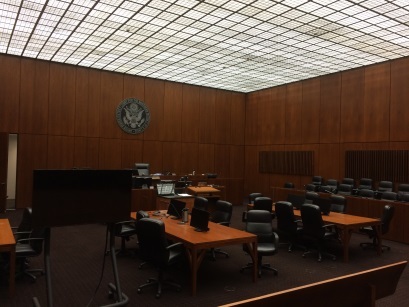 A jury blackout switch sends static noise to the jury box to block out sidebar conversations between the judge and counsel. 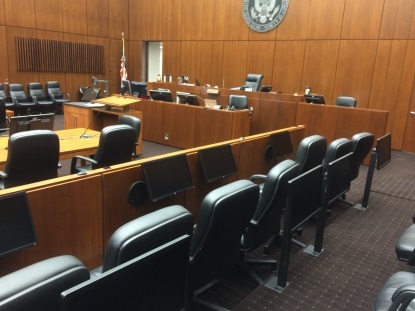 Video conferencing is available with advance notice in all integrated evidence presentation courtrooms.. Located at the lectern and one at each counsel table. We will provide VGA/HDMI cables to connect counsel's computers to the evidence display system. 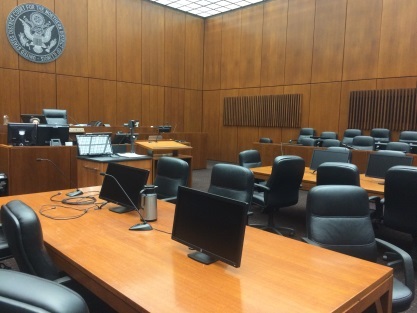 Each Integrated Evidence Presentation Courtroom is equipped with 23 inch flat panel monitors located at the judge’s bench, podium, counsel tables, witness stand and jury box. The gallery views evidence from two 55inch flat panel displays.